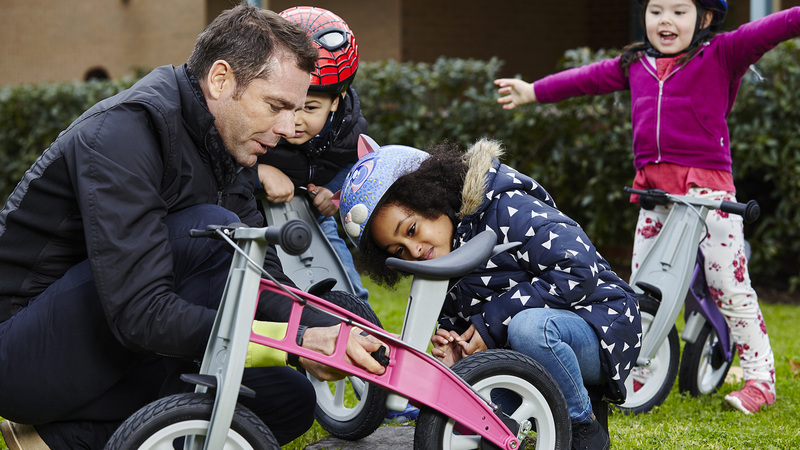 Cadel Evans touches on bike equipment safety and being observant on and around roads. Bike riding is the perfect activity for kids. It’s lots of fun, it’s great exercise and it’s something that the whole family can enjoy together. But like any physical activity it does come with risks, especially when riding on the road. Just like motorists, bike riders of all ages need to follow the road rules and share the road responsibly. So what’s the best way to educate our children on safe biking and road use? One of the most important things we can do is to set a good example. By following the road rules and modelling safe bike behaviour, we can teach our children what’s right and wrong when riding. To help you brush up on your bike safety skills, here’s a checklist to follow. Wear an Australian Standard bike helmet that fits well and is fastened correctly. Wear enclosed shoes and bright coloured clothing. This will make it easier for motorists to see you. Keep your bike in good working order. Check your brakes, tyres and quick release wheels each time before you ride. Check your bike has a working bell or horn that you can use to warn other riders and pedestrians. If you’re riding at night, check your bike has working front and rear lights, as well as reflectors. "Understanding bike and road safety is life-saving skill, so make sure your kids get plenty of time to learn and practice." Children under 12 years of age and their supervising adults are legally allowed to ride on the footpath. But remember, footpaths are made for people to walk on, so you need to be careful and courteous when riding. Keep left and give way to pedestrians on the path. Ride at a safe and manageable speed. Use your bell or call out to let others know that you’re approaching. Check over your shoulder and behind you before turning a corner. Ride in single file so other people can pass you if needed. When you come to a road, stop, hop off and walk your bike across when it is safe to do so. Try to use pedestrian crossings when you can. Be alert and keep watch for cars that are coming in and out of driveways. Keep an eye out for other hazards, such as fallen branches, potholes, broken glass or dogs off their leash. "Always use the safest route. Try to use cycle paths when you can and avoid heavy traffic areas." Obey all road rules, road signs and traffic lights. Ride in a straight line about one metre out from the kerb or any parked cars. Keep both hands on the handlebars, except when signalling turns. Before you turn a corner, check behind you and hold your arm out to signal which direction you’re turning. Look ahead and keep watch for any potential hazards. Keep a safe distance behind cars so motorists can see you in their mirrors. Never ride more than two abreast. That means no more than two people riding side by side. Use the safest route. Try to use cycle paths when you can and avoid heavy traffic areas. Understanding bike and road safety is life-saving skill, so make sure your kids get plenty of time to learn and practice. That way, both you and your child can feel confident when the time comes for them go out and enjoy a ride on their own. Find more kid-friendly bike and road safety tips.